The majority of the our manufacturing occurs in the Layup Department. Each blade is hand crafted by trained VHA employees who use a variety of tools and methods to ensure precise measurements. Supervisor oversight and periodic inspections throughout the work order process guarantee stringent quality standards are met. The process starts in the kitting room where materials are measured, cut, and assembled into kits for blade layup. Parts that were manufactured in the Machining Department are also delivered to kitting, where Layup Department personnel ensure that they have all of the parts required for blade assembly. 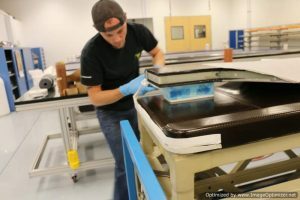 Kitting and layup take place in temperature and humidity-controlled clean rooms, which safeguard materials from outside foreign objects, dust, and even moisture. Once the kits are complete and inspected, the assembly part of the process begins. The layup process involves many different stages of bonding that allows for the composite material to adhere to the parts of the blade being assembled. Since VHA composite blades are made up of different layers of material, multiple bonding stages are necessary. After each bond stage, the blade assembly is either debulked with pressure only in the autoclave, cured with heat in the industrial oven, or cured with both pressure and heat in the autoclave. After the blade is assembled and all bonding stages are complete, the blade is sent to the paint department where the process of protecting the blade assembly begins.